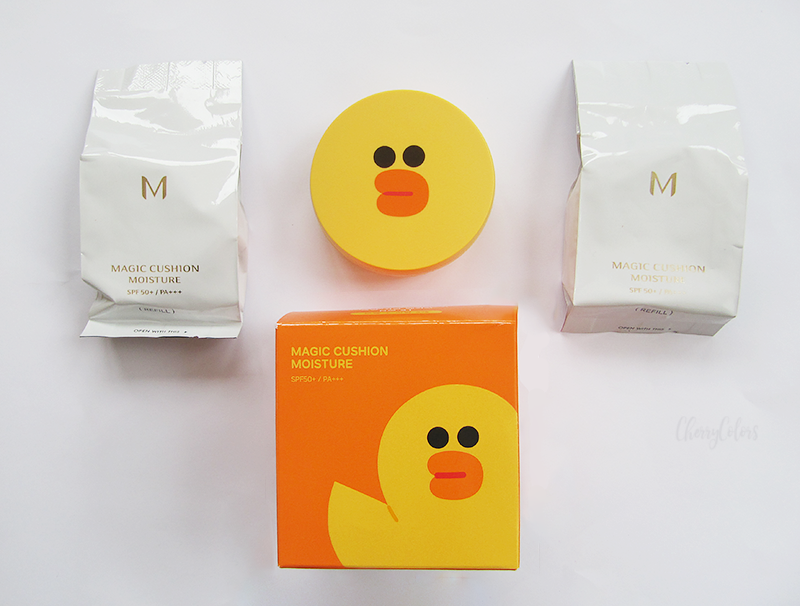 MISSHA MAGIC CUSHION MOISTURE x LINE FRIENDS EDITION - Cherry Colors - Cosmetics Heaven! 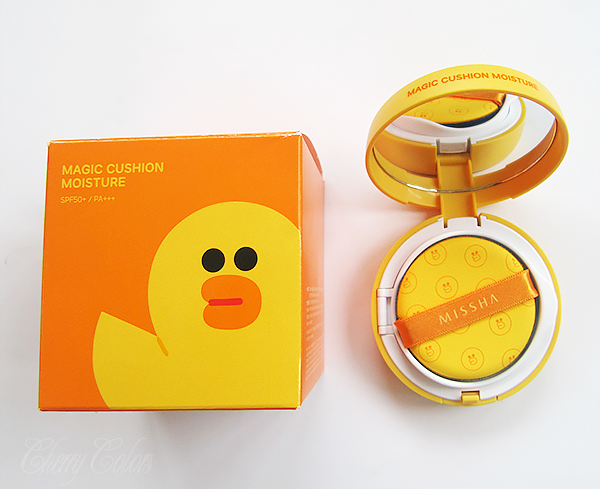 In my last "new in" post, you could see I got this super kawaii BB cushion from Missha. 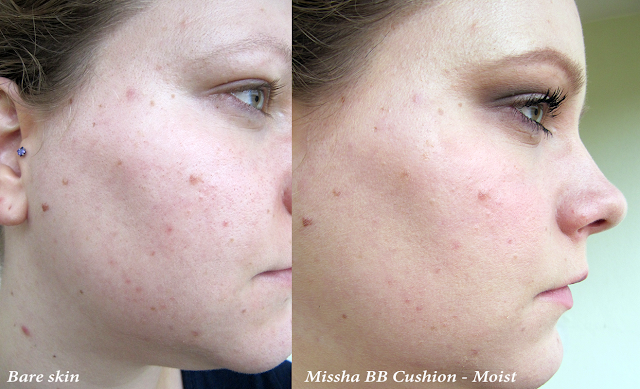 I wanted to post some information about the BB cream which should be available on the Missha website, but after a long search I can't find a damn description of the Magic Moist cushion! I mean, seriously guys?! So, what's the deal with these BB cushions? Well, truth to be told, they've been on the market for more than a year and people seemed to love them. I mean, really love them. The difference between BB cushions and regular BB creams is that these come with a nice compact case which is travel-friendly and you can always have it with you. With regular BB creams, it's kind of annoying trying to fix your makeup when you're somewhere outside. But with a BB cushion, it's really easy! Why did I buy it only now? Simply because Missha came out with a more affordable version and the most important for me, this is where my brain went actually blank and I had to buy it right away, is that the packaging is super cute! Before Missha, there were bigger and more luxurious brands that came with their versions of BB Cushions and those were pretty expensive (talking about $40+). I am not willing to pay that much for a product that will run out in three months. Yes, one BB Cushion is supposed to last about 3 months if you use it daily. Of course, you can totally use it for longer. So, this is why I was so happy that I managed to get this set for $20! Which, if you ask me, is totally a steal. Err, a deal. The refills are packaged separately, so they won't get dry while they are patiently waiting to be the next in use. Just look at them. Aren't they cute!? I even saved the box to keep them in, because it's so damn adorable! So, who's Line Friends? I mean what are they? Why are they famous? Truth to be told, I had no idea until I downloaded an app called "LINE wallpapers". It has the best and cutest wallpapers for my phone. And there are many wallpapers with the Line friends. At first, I couldn't stand the weirdly drawn characters. The weirdness of them. But they grow up on me. Now I like most of them. Here are all the characters. I am still not sure what exactly are they and why are they popular, but okay. If you do know, please do write it in the comments. I didn't know that there were two versions of it. I just saw the cute packaging and the amazing price and it had to be mine. End of story. But I got the Moisture version which is supposedly for dry skin and it gives a nice dewy finish. This is what the cushion looks like. So porous. So... uh, okay. Maybe not for those with trypophobia (fear of small holes, particularly irregular patterns or clusters of small holes). 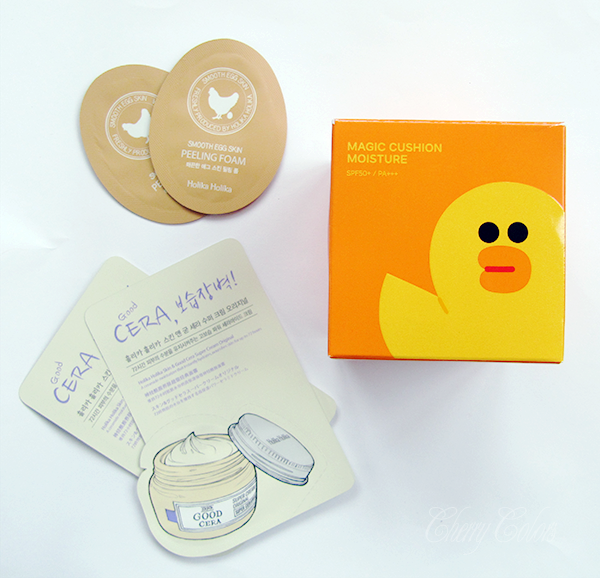 The cushion is nice and soft and if you press it, the BB cream comes out. 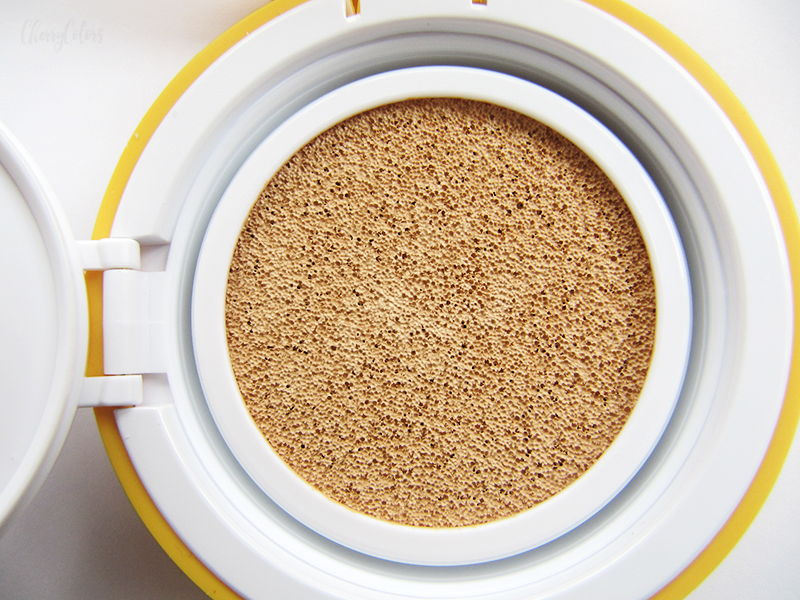 It looks and feels like a moisturising foundation. Quite nice to be honest. At first, I was really sceptical if the small puff would do its job well at applying the BB cream. But surprisingly it does! It helps spread the foundation easily and blend it in the skin. The skin test. Here's an unedited picture of a before and after shot. 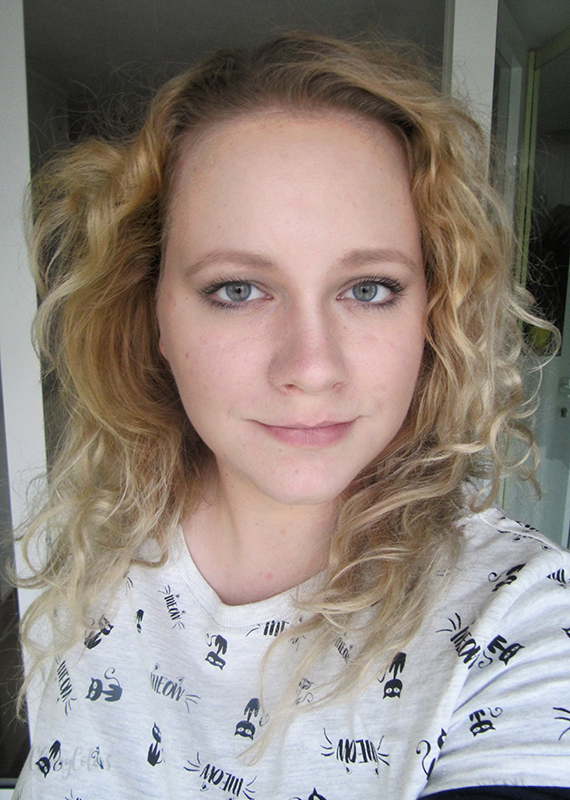 Sadly, on the after shot I applied a mattifying powder, so the result isn't as dewy as it should be. The coverage is light to medium. It does cover some redness, but it will barely cover acne or acne spots. A close up. I didn't sleep that night. I have a combination skin type. And I was really sceptical about how such a moisturising product would work on my skin. Even if it's a bit on the dry/normal side in the colder months, I wasn't sure if I didn't just throw money into the wind. But I realised that now I can just skip the heavy cream before the BB cushion use and just use it instead. I can apply my serum and oils and whatever and then use the BB cushion and I'm done. I don't even need to set it with a setting powder because I like the natural look it gives me. 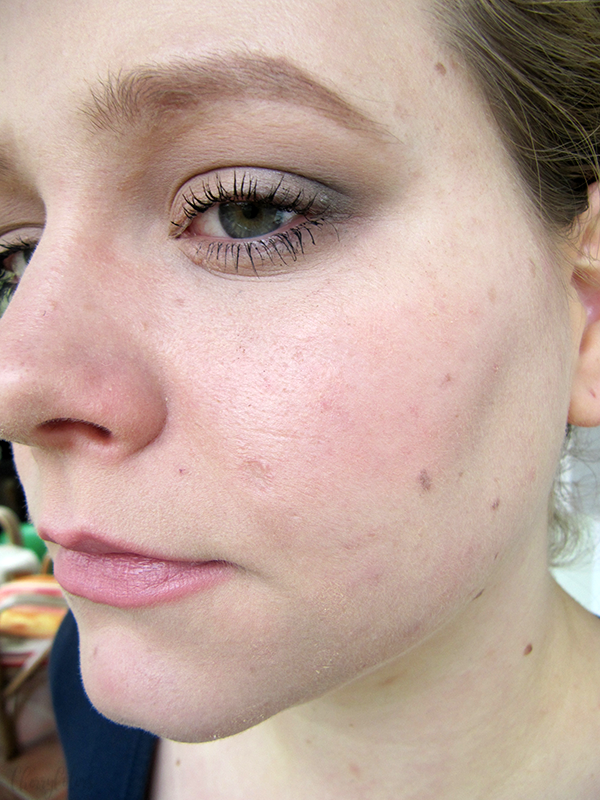 And this way the setting powder doesn't have the chance to cling to dry patches! YES! And I think it's perfect for any skin type, during colder months. But skip it if you're planning on using it during Summer and you have extra oily skin. P.S. Of course, Line x Missha are coming out with a new LE of lovely items. Of course. Bye bye money. Check it out, here. Do tell me in the comments if a product "buys you" if it's extra cute?